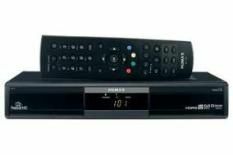 Humax Foxsat-HD review | What Hi-Fi? Being the first to market with a brand new type of product is always a risky business, but in our First Test of the FOXSAT-HD, we were confident that Humax had produced a very solid first entrant into the Freesat arena. Now it has direct competition – and our confidence has been proved correct. The FOXSAT-HD is a really brilliant product to use, and that cannot be underestimated as a plus point, particularly when you're talking about a totally new type of product. No one will struggle to get the Humax up and running; initial set-up is quick, clear and effortless, and navigating the simple menus and EPG is a breeze, thanks to clear, sharp fonts and enough transparency to see the currently selected channel as you scroll. Navigation is very quick and smooth, and you really get the feeling that Humax has put genuine effort into making the FOXSAT-HD as 'live-with-able' as possible. Even the remote is intuitively laid out and comfortable, if a bit cheap-looking. The FOXSAT-HD is also a very capable performer, and if you're new to HD, the high-def offerings will blow you away. Compared with a standard-definition broadcast, BBC HD's pictures are incredibly sharp, detailed and vibrant – just try flicking between the BBC's standard-def broadcast of the football, and the HD alternative, and you'll soon realise what all the fuss is about. The Humax does give away just a little bit of detail compared with Sky's handling of HD, but there's not much in it. The accompanying Dolby Digital soundtrack is also very exciting on paper, and it's true that it can add a great deal of immersion to broadcasts. The extra detail and clarity it adds to a programme such as Later with Jools Holland is very pleasing, and the distinction in the surround field between the performer and the audience makes it a much more involving experience. If we're being picky (and that is our job), we would say that we would like just a little more weight to the sonic delivery, both with Dolby Digital and stereo signals, but the performance is generally very decent. Of course, with only one and a half HD channels currently available on Freesat (ITV's red-button HD doesn't count as a whole channel! ), the Humax also needs to impress with standard-definition broadcasts, and for the most part, it does. Switch to the brilliant Peep Show on Channel 4, and the stability that the FOXSAT-HD provides is immediately impressive – noise levels are very low, and difficult patterns remain generally solid. Colours are also bright and punchy, but they do occasionally tiptoe into the realms of looking overcooked, and edges could be a little bit sharper. The Humax has loads of competition, not just from other Freesat HD boxes; but it fares very well indeed. Clearly Sky HD has the advantage of more channels, both HD and SD, and it also performs a little better, but the FOXSAT-HD is so much cheaper (half the initial price and without a monthly subscription) that it closes the gap a fair deal. And, finally, the Humax also looks good against other Freesat boxes. They're all remarkably close in terms of picture and sound performance, but the Humax is significantly simpler and more stylish to use – we liked it a first time round, and we feel the same way now.